Need a quick vegetarian breakfast idea? 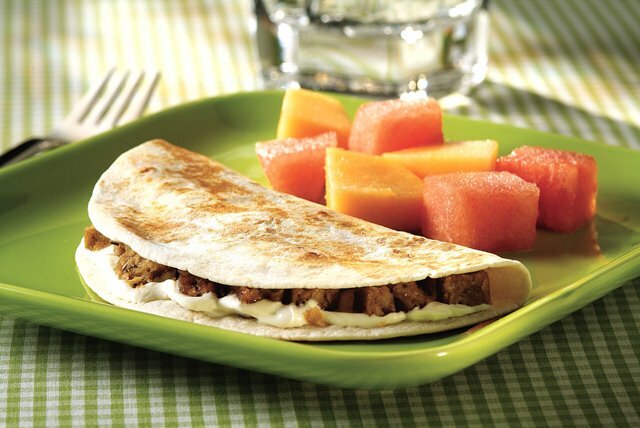 Our creamy quesadilla with Boca Meatless Breakfast Links is a hot morning pick. Heat breakfast links as directed on package; cut lengthwise in half. Spread tortilla with reduced-fat cream cheese; top with links. Fold tortilla in half. Cook in nonstick skillet on medium heat 2 min. on each side or until lightly browned on both sides. Serve with TACO BELL® Thick & Chunky Salsa. Or for a zesty twist, spoon small amount of salsa over quesadilla filling before folding tortilla in half to cook.